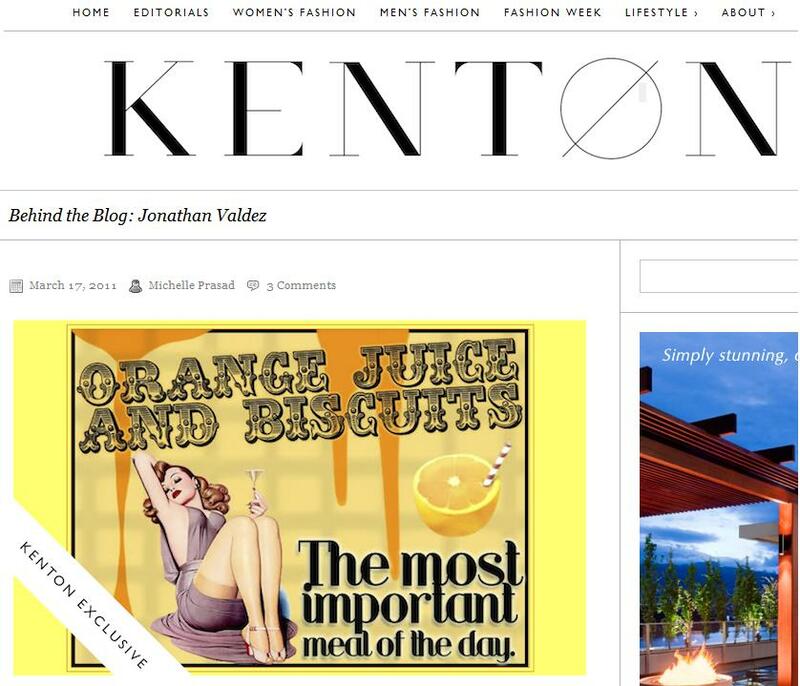 OJ&B In The Press: Kenton Magazine Interviews OJ&B For "Behind The Blog" Series! 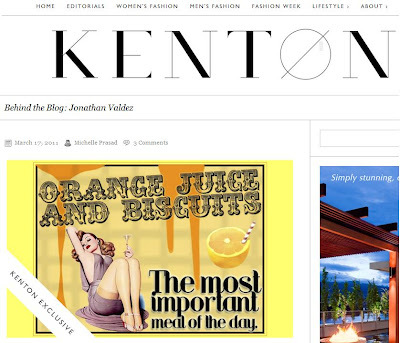 I was honored when Alex Liang, editor-in-chief of Kenton Magazine, asked if I would like to be featured in their "Behind the Blog" series. Check out the interview and find out was said when they asked me about OJ&B, my dream job, my fave fashion trend of Spring/Summer 2011 and more! Jonathan Valdez is the writer and creator of OrangeJuiceAndBiscuits.com. The Texas native, now resident of New York City first received notable attention from Mashable Open Web Awards in 2009, when OJ&B was voted as one of the “Top Five Best Bloggers to Follow”. OJ&B is your virtual behind-the-scenes look into industry events that any fashionista would enjoy adding to their daily web-read. I recently had the opportunity to ask Jonathan Valdez some questions about his blog and he was gracious enough to provide us a look into who he is and what he loves to do! Michelle: What is the content focus of OJ&B? Jonathan: Pop culture and fashion and really anything else that I might want to talk about but mostly fashion, pop culture and events in NYC. Michelle: Why blog? What is your goal of starting OJ&B? What do you think makes your blog different – What does OJ&B offer that is unique in the market of online journalism? Jonathan: I blog because it gives me an outlet to express my thoughts and opinions on the things that I love like pop culture and fashion and no one can tell me what I need to or should say. My goal is to have fun and have a place to voice my opinion. I want to make people laugh. OJ&B is a place to escape. Michelle: How do you gain access to the content you write about? Jonathan: By working hard and developing relationships with amazing people. I am also constantly reading and absorbing information and I love sharing it with my readers. Michelle: How much time do you spend on a typical day on OJ&B? Jonathan: I try to update at least once a day. It can be crazy sometimes, because I spend a good amount of time on a post, editing pictures and writing an article. I am the only writer. Michelle: What has been the greatest and most rewarding experience that you have received from becoming a blogger? Jonathan: Meeting and running into my readers. They really get me! My readers have no fear in coming up to me at an event or on the street to say hello and I love that. You write a blog and you never know who will access it. I love getting “tweets” from people saying that I make them laugh or that they enjoy the site. I love to entertain and make people laugh. The world is too serious. Michelle: What would be your ideal job? Jonathan: My ideal job would be having my own talk show on T.V. or on the radio. I love interviewing people in person, because I feel that is how you really get a sense of who they are. Michelle: What has been your favourite fashion trend of 2011? Or, what are you hoping to see on the runways this year? Jonathan: I am LOVING all of the color for spring. Bright, bold color. I always wear color and I am glad to see so many fun, orange pieces for spring! Michelle: Do you have any advice for those looking to vamp up their own style this year? Jonathan: Be yourself and do it proudly! Fashion is supposed to be fun and it says so much about who you are. Also, don’t wear Crocs or Uggs. I want you to be yourself, but I also don’t want you to look a mess. Michelle: What do you want your readers to know about you? Jonathan: Everything I do, I do out of love. I consider myself somewhat of a comedian, so I am never trying to offend anyone. Also, I love hearing from my readers on Twitter and in person. If you see me say hello! Michelle: Do you have any advice for anyone looking to start his or her own blog? Michelle: Where do you see your blog in the next year or two? Jonathan: I see my blog with a facelift with more features added to it. I also see myself being a brand ambassador and having sponsors. Thanks again to Michelle and Kenton Magazine! Check out the original posting by clicking here.